In November of 2009, Carrie and I got to meet Dave and Cora Kent when we stayed at their vacation rental casita in Boquete, Panama. We fast became friends, and had dinner at their home a couple of nights while we stayed at their casita. Dave and Cora also taught us a Dominoes game called Mexican Train. Since then, we have taught lots of people this simple but fun dominoes game. We’ve also taken to calling it “Community Train, or even “Trash Train”. In the original game, there is a train piece that goes on the open train of dominoes. Anyone can play on this open train at any time. 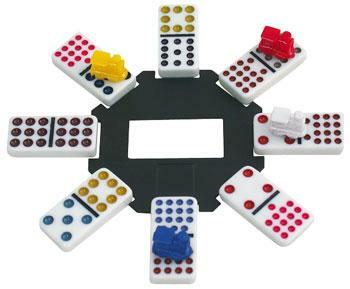 But sometimes, we have just had a normal set of dominoes, not “Mexican Train” dominoes. This has necessitated finding our own piece to place on the open/community train. Most of the time, a used candy wrapper or other little piece of trash serves the purpose of going on the open train. One time we were playing with my brother and he started calling it the trash train. So now we call the game “Train Dominoes”, “Community Train”, “Trash Train”, or “Mexican Train”. In any case, it’s one of our favorite games to play with friends and family, and we’d like to share it with you. If you would like to win a free set of Mexican Train/Trash Train Dominoes shipped directly to your door, go ahead and follow the instructions below to win this Giveaway Friday. Step 1: Use the links above or below to post that you like this giveaway on Google+, Facebook, or Twitter. Step 2: Use the comments below and post your favorite board game or card game. If you don’t have one, say which game you think you might like to try sometime. I like card games, would like to learn this train dominos. I now play scribble on line with FB friends. Love this game, don’t own one yet. Where do you purchase it?